We've come a long way since the days when the only way you could track Santa's annual trek across the globe was by radio and telephone. Now there's no better way to figure out how close Santa is to your chimney than by hopping online. Whether you want to track Kris Kringle on your mobile device or PC, here are the details you need. Any Santa tracking article has to start here with the original Santa trackers, the North American Aerospace Defense Command. NORAD's annual tradition of tracking Santa Claus on his Christmas trek around the world began by accident in 1955, when a Colorado Springs-based Sears published a newspaper ad promising kids the chance to call Santa on Christmas Eve. But instead of Kris Kringle's hotline, the ad mistakenly printed the direct number for the Commander-in-Chief of Continental Air Defense Command (CONAD), the predecessor to NORAD—a hotline reserved exclusively for calls from the Pentagon and high-level military commanders. That night, calls from kids looking for Santa started rolling in to CONAD's Colonel Harry Shloup. Not wanting to disappoint the children, Shloup had his staff check the radar for a reindeer-powered sleigh moving southward from the North Pole. Children who called in to CONAD that night were given updates on Santa's location, and a tradition was born. NORAD used to team up with Google to keep tabs on the man in red, but since 2012 Microsoft has held the contract to run NORAD’s Santa tracking operations. The official NORAD Santa tracker website, powered by Microsoft. NORADsanta.org features a Claymation-style Santa’s village with all kinds of festive activities, such as games, holiday music, Santa and NORAD-themed videos, articles about Christmas traditions, and (of course) the Santa tracker powered by Bing Maps that goes live on Wednesday. The NORAD Santa tracker mobile app. If you’re mobile on Christmas Eve, you can download the NORAD Tracks Santa app for Android, iOS, Windows Phone, and Windows 8.1 tablets. Alternatively, you can try the new mobile site Microsoft put together for 2014. Just visit NORADsanta.org on your mobile device and you’ll see the touch-optimized mobile version. As Santa makes his stops along the way you’ll be able to see a curated Bing results page with facts and images about each location. Microsoft also has a special treat for Windows Phone 8.1 users: You can ask Cortana “Where is Santa now?” to get the latest updates. Less fancy Bing fans can type the same phrase into Microsoft’s search engine to get a text-based update. If you’re looking to pass the time for any little Santa enthusiasts on Wednesday, Microsoft has some Santa-themed coloring pages you can download from OneDrive. The countdown includes Google holiday classics. My personal favorite is the Santa voice mail utility—well worth using over and over and over again. I’ve yet to meet anyone who hated the surprise of getting one of those calls. Just as with NORAD, on Wednesday Google will let you track Santa on Google Earth via its Santa site, complete with facts about each destination. 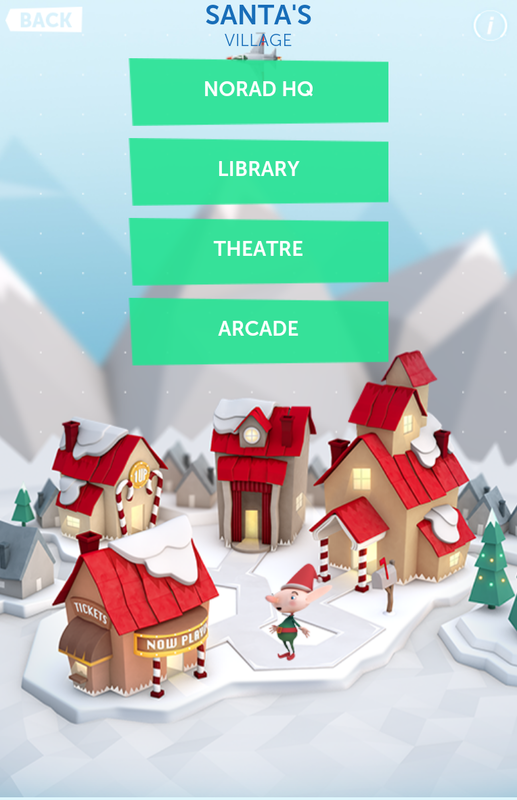 Google's Santa Tracker Android app. Mobile users can download the Android app or use the mobile site at santatracker.google.com. There’s also a Chrome extension to keep Santa updates just a click away. The extension adds a few neat Christmas-themed HTML5 tricks to any web page you’re viewing, providing an elf bus stop and friendly-looking Zeppelin for you to play with, as well as steadily frosting the window from snow. Google hasn’t said anything official about using Google Now to get updates on Santa’s whereabouts, but it looks like you’ll be able to do it in some form. Typing “where is Santa” into Google brings up an image, a location (Santa’s Village at the time of writing, on December 22), and a note on how many days until Santa departs. The same thing happens on mobile using Google Now, although Google didn’t read out the location during my tests on Monday. To monitor Santa on your favorite social networks, you can follow Google Maps and NORAD Santa on Twitter. There’s also the NORAD Santa Facebook page and YouTube channel, and Google Maps on Google+. Note that Google and Microsoft track Santa on different schedules: NORAD is ahead by about three hours. Maybe NORAD’s tracking stations start farther north than Google’s? Whatever the reason, if your children are keen observers they could notice some discrepancies. You may want to stick with one Santa schedule instead of flipping between the two.